Attention, this save is for increased difficulty, recommended for players who seek a challenge on new game plus. 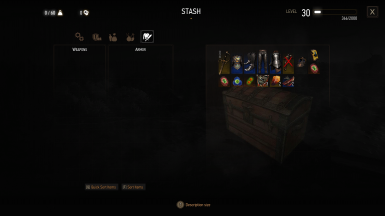 Geralt is naked with 0 crowns + essentials stored in stash, read description for more info. More XP This is optional, but if you want to reach 100 lvl faster I recommend Double the XP rewards version or any other version of this mod. Hello this is my level 30 save for NG+ to obtain the maximum difficulty possible, I worked a lot on this save because I had to fight many enemies with red skulls, I did not used any cheats/mods or console commands. ~Geralt is lvl 30 (lowest possible lvl for NG+) with 0 crowns and 61 ability points (Base game ALL Places of Power + B&W + Quests + Magic acorn). ~No B&W mutation or skills. ~You are naked, no skills learned, no items in inventory (some are stored in stash read bellow), once you start NG+ you will receive default kaer morhen armor + silver sword. Ravix set including sword/crossbow/saddle and ornate shield from "The Warble of a Smitten Knight" B&W DLC, this was a personal decision because I plan to play as "Geralt of Rivia" on NG+, this way is possible to have both ornate shields. Succubus/Doppler/Ancient Leshen/Troll mutagens because I plan to spare this monsters on NG+ and also have the decoctions. And this is optional, 3x troll hides, 2x troll livers, 2x golem hearts. 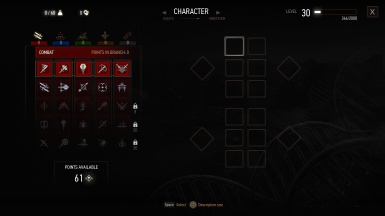 This was the maximum I could do in order to obtain the "essentials" and keep Geralt at lvl 30 simple in order to make NG+ a challenge.